Everyone likes making an entrance, and your front door is one of the first design elements that guests see when first arriving at your home. You want your door to be inviting and aesthetically pleasing to match your home’s exterior. The front door is also meant to protect you while you’re indoors, so it also needs to be functional, durable and weather resistant. You wouldn’t think your door has an impact on the energy efficiency of your home, but it does. Entry doors must be solid enough to withstand the wind, rain, scorching sun, and would-be intruders, yet handsome enough to make a good first impression. Steel doors are probably the most common doors, for several reasons. The first, of course, is that they are the least expensive option. More popular than wood doors, steel doors feature energy-efficient foam core insulation. These doors are fully weather-stripped, reducing chances of shrinking, swelling and warping. Because of their solid construction, steel doors will withstand years of extreme weather conditions with minimum maintenance. However, steel doors are vulnerable to dents, and if the painted skin is breached by a scratch or severe dent, it can rust. And don’t combine a steel door with a storm door; heat build-up between the doors can cause the surface to peel. Because it can rust, it isn’t always the best choice for a home subject to harsh weather conditions. Also, steel conducts temperature, which is not ideal in an extremely hot or cold environment. The doors can be purchased with predrilled doorknob and lockset holes, and most steel doors are packaged pre-primed and ready to paint. Steel doors offer extremely durable and affordable solutions for your exterior door needs. Fibreglass composite doors are relatively affordable and are most often chosen for their durability, and the fact they’re almost maintenance free. These doors can last a very long time, and many models offer warranties for as long as the buyer lives in the house. Fibreglass doors are much more resistant to damage than steel and can be made to mimic genuine wood accurately, but without the drawbacks of wood. These doors can be painted or stained any way you choose. Because fibreglass composite doors can go several years without needing any paint or stain touch-ups, they tend to work very well in harsh and humid climates. This material lasts longer than wood or steel, and its foam core offers much more insulation than wood. Fibreglass doors share many of the benefits that wood and steel doors offer with a special sense of durability. Energy efficient and practical for high-traffic entrances, fiberglass doors have wood grain texture molded into the door so that they give the appearance of a real wood door when painted or stained. Fiberglas undergoes little change because of weather. Available in many styles and sizes, fiberglass doors are perfect for homeowners concerned with longevity, practicality and home security. Genuine wood is the traditionalist’s choice and available in just about any commercially logged wood, from premium species like mahogany, teak and walnut to economical paint-grade species such as hemlock or pine. Wood is one of the more common choices for a front door. Despite the faux substitutes, nothing can beat the real deal for many homeowners. Modern wood door models are often sandwiches of wood veneer skins over a wood core. This construction tends to minimize the chance of warping and also lowers cost. 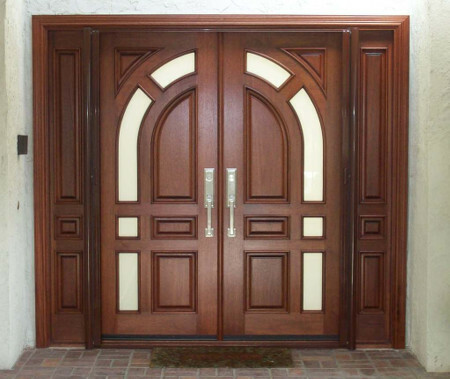 For this type of wood door, look for furniture-grade veneers that are at least 1/16 inch thick. Anything thinner may be too easily damaged. While wood doors are luxurious and beautiful, they also offer a fair amount of upkeep. Wood is sensitive to moisture, and wetness in the wood can cause the door to warp, crack and change shape. Sun is also an important factor in the life of your wood door. If your door is protected from these elements, it’s bound to last much longer. When shopping for pre-finished wood doors, look for durable stains and high-gloss finishes, since these will best protect the wood. If you’ve decided to apply the finish or stain on your own, make sure to put the finish on the top and bottom edges of the door as well to help prevent it from absorbing moisture. The substantial weight of a wooden door adds a sense of security and sturdiness to your home. Wood doors are most at home with traditional American styles, including Colonial, Cottage & Craftsman, Ranch, Split Level and Victorian.